Jonathan Cape, 1998, Hardback in Dust Wrapper. From the cover: “The British may have claimed the 19th century by force, and the Chinese may cast a long shadow over the 21st, but the 20th century belongs to the United States. This is the premise behind Harold Evans’s robust, sweeping, spectacularly illustrated account of the people and events that gave rise to America’s political and cultural dominance. 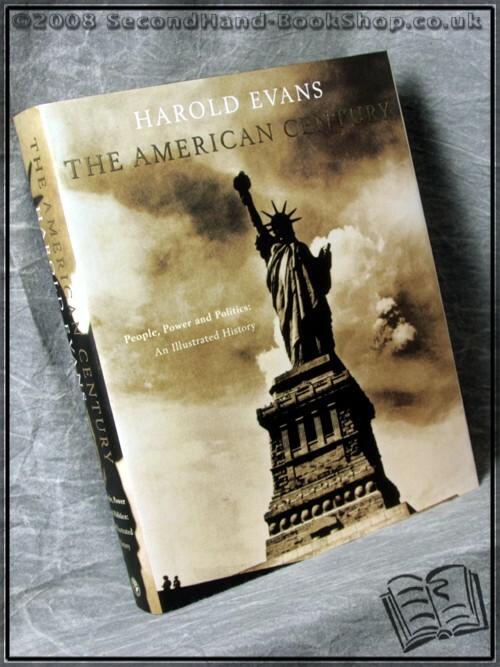 Evans begins in the 1880s, when it was still uncertain whether America, with its diverse peoples, manifold beliefs and impossible ideals, would even survive its own democratic experiment or manage to reconcile an increasingly headlong materialism with the original virtues of the Republic. He shows how, from that time forward, the citizens of the United States saw increases in wealth and personal freedom unequalled in history, paralleled by the growing power and influence of the country abroad. He covers upheavals and victories with succinct and insightful prose, aided by a splendid array of 900 fresh, remarkable images. Here are the Presidents, nineteen of them, from a Civil War general to a movie star; here are Al Capone and J. Edgar Hoover, Martin Luther King and the Ku Klux Klan. Size: 11½" x 9¼". Black boards with Silver titling to the Spine. [XXIII] 710  pages.